We hosted our 2nd annual symposium entitled "Building and Strengthening the Child Protection Network" at St. Joseph University, Faculty of Medicine on the 21st and 22nd of October. Child maltreatment is a significant public health and social problem in Lebanon. Child maltreatment includes physical, psychological and sexual abuse as well as neglect. There are a myriad of associations between child abuse and neglect and the physical, mental, social health and professional development of children. The traumatic consequences are capable of lasting well into adulthood impacting the well-being and health outcomes of adults and sometimes of future generations. Ensuring the comprehensive protection of children and their rights can never be reached through the efforts of a single organization. A strong, nationwide network must be in place to safeguard the rights of all children residing on Lebanese soil. That network must extend from governmental ministries, UN agencies and other organizations including, but not limited to, schools and media outlets. By joining child protection stakeholders from these different fields himaya hopes to highlight the importance of collaboration and exchange at the different levels of the child protection network. Challenges and obstacles faced by organizations, as well as best practices, must be identified in order to continuously improve the quality of services and maximize their reach in the field. Child protection is a relatively recent notion. It was at the start of the 20th century, after witnessing the horrors of the First World War, that nations came together to address children’s vulnerabilities and needs. The Geneva Declaration of the Rights of the Child was adopted 26 September 1924 by the League of Nations. Since then, child protection initiatives have multiplied and evolved worldwide. Currently in Lebanon, there are a number of projects, programs and organizations working towards safeguarding the rights of children. This panel will be scoping contemporary Lebanon’s perception of children from an anthropological, social and judicial perspective. Lebanon's position regarding child rights, and the efforts to safeguard these rights by governmental institutions and civil society will be addressed. These efforts will also be examined through the lens of society’s beliefs and values regarding the place of children. It is undeniable that the media can play a significant role in raising awareness about child abuse and issues related to child maltreatment. 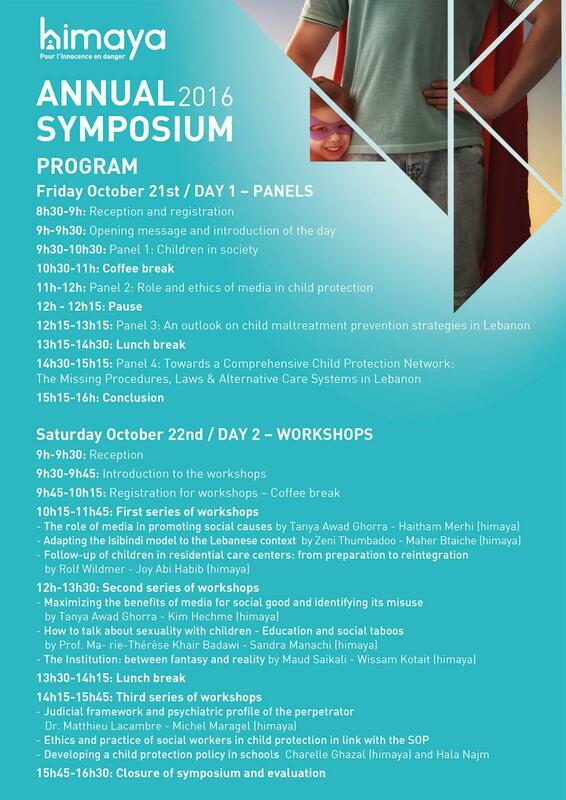 However, today in Lebanon, we are seeing more “scoop” stories in a range of programs revolving around cases of abuse that are sometimes tackled with little consideration towards the wellbeing of children and their families. This puts the media’s role regarding child protection in question. In this panel, the ethics surrounding the media portrayals of child maltreatment will be discussed along with its potential positive and negative effects. The approaches of Lebanon’s media with regards to child maltreatment will be tackled along with their potential in driving social change. Providing children with safe environments and stable relationships is essential to the reduction and prevention of child maltreatment. In order to reinforce such conditions, the environment of the child must be supported at the familial, educational and community levels. A multi-level approach can improve the success of interventions and help build a comprehensive foundation for children to grow into healthy adults. The purpose of this panel is to discuss prevention strategies for communities in Lebanon. In recent years, the child protection sector has seen significant growth through the implementation of SOPs, the MOSA child protection policies and their child care contracts. Nonetheless, there are numerous avenues that still require exploration and development, including, but not limited to: developing strategies for the follow-up of perpetrators of child abuse, alternative care systems and nationwide child protection policies in other sectors such as the health sector. 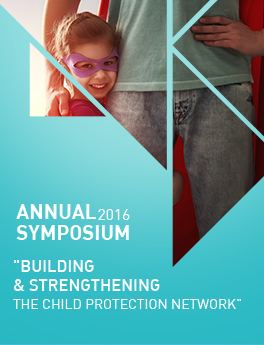 This panel will explore the field of child protection with focus on policy, procedures and alternative care systems. Media has always had a role in creating and shaping public opinion. Reporters through media channels can play a significant role in raising awareness on social issues and influencing health behaviors. This workshop will tackle media’s role in highlighting social causes. The National Association of Child Care Workers (NACCW) developed the Isibindi program in response to the HIV and AIDS epidemic in South Africa.. The word ‘Isibindi’ is isiZulu for ‘courage’. The program is a community-based intervention that provides prevention and early intervention care for children in poor communities where few services previously were available. This workshop will address how this model can be adapted in Lebanon, focusing specifically on the safe park initiative. During this workshop, we will examine the process - before, during and after - of placing the child in residential care, according to the standards of Quality4Children. This workshop will give participants the opportunity to share and discuss practical examples of media engaging in social issues. Constructive efforts and questionable representations of social causes will be discussed in order to identify positive principles/effective practices. The media responsibilities and practices of organizations in the social field will be also be outlined. Based on experiential situations suggested to participants, we will attempt to understand why institutional functioning is faced with obstacles in reaching their objectives, such as child protection, social reintegration and rehabilitation. This will lead to exploring the continuous interaction between reality and fantasy in regards to the institution and its effects on its functioning. This interaction often leads the institution to react in a violent and negligent way instead of reflecting, in a free and liberating manner, on its own becoming, that of its professionals and consequently of its beneficiaries. The notion of child sexuality, the idea that a child could be a sexual being has been a controversial topic ever since Freud first brought it up in the end of the XIX century. Freud faced harsh criticism from his viennese peers and over a 100 years later, child sexuality is still a taboo with many false ideas regarding the subject held and spread by parents, teachers and medical service providers. This workshop will touch on these criticisms, Freud’s theoretical foundations and how to address this subject in our contemporary society. The impact of sexual violence on the physical and mental health of children is major, with consequences throughout the whole life of the victim. This is why the community should implement screening devices, but also medical and legal care for victims and perpetrators. For the cessation of violence, the society must protect the victim, and also treat the perpetrator. We propose to study the different profiles of the authors of violence and the medico-legal devices to support them. A holistic intervention strategy takes into account the psychological, social and judicial aspects pertaining to the case at hand. Through an in depth case study, himaya will expose how they introduced and integrated the SOP to their own intervention strategies in a practical and ethical way. Children that are enrolled in schools spend a significant amount of their childhood in the school setting, making it one of the most influential contexts for a child’s social and emotional development. Therefore, the educational environment plays a pivotal role in realizing child protection. Since national guidelines for child care policies have not been developed or implemented at a national level yet, some school have taken the initiative to fill that gap at their level. During this workshop, we will be discussing the establishment of a child protection policy in schools based on a pilot project created between himaya and a Lebanese private school.